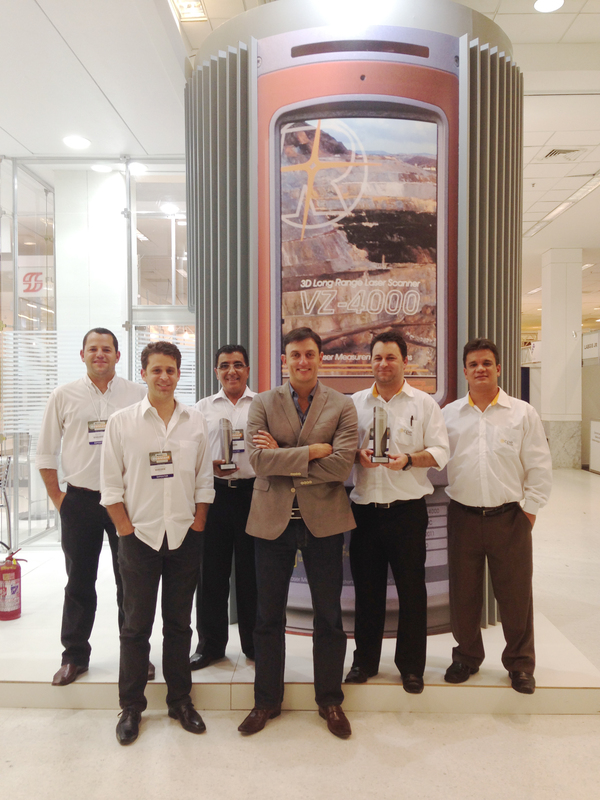 RIEGL is Latin America’s Most Memorable Brand of Terrestrial Laser Scanner! RIEGL was honored to accept the 2014 MundoGEO#Connect Award for Most Memorable Brand of Terrestrial Laser Scanner at the MundoGEO#Connect Latin America 2014 Conference and Trade Fair of Geomatics and Geospatial Solutions, which took place at the Frei Caneca Convention Center in Sao Paulo, Brazil, on May 8th, 2014. The prize was received by Mr. Roger Neves, CEO of RIEGL‘s partner in Brazil, CPE Equipamentos Topograficos Ltda. (www.cpeltda.com.br) “CPE is proud to be the RIEGL dealer in Brazil and is very pleased to see RIEGL getting the deserved market recognition!” said Roger Neves. “We are very pleased to receive the MundoGeo award for the most memorable brand, which is an acknowledgment of the outstanding qualities of our VZ-Line terrestrial laser scanners. Congratulations to our partners for building up the RIEGL brand throughout South America!” commented Johannes Riegl Jr., RIEGL Chief Marketing Officer. RIEGL terrestrial laser scanners provide detailed and highly accurate 3D data rapidly and efficiently. The applications for the scanners are wide ranging and include: Topography, Mining, As-Built Surveying, Architecture, Archaeology, Monitoring, Civil Engineering, City Modeling, and others. All RIEGL terrestrial laser scanners are high performance and fully portable instruments, tested at strict standards to ensure reliable performance, even under the most demanding conditions. RIEGL is widely represented in South America through strong distribution partners, besides Brazil in Argentina, Bolivia, Chile, Ecuador, and Peru. The MundoGEO#Connect Latin America Conference and Trade Fair for Geomatics and Geospatial Solutions is the largest geospatial event in Latin America. The MundoGEO#Connect Award is the highest prize of Latin America for brands of the geotechnology industry. It recognizes professionals, institutions, companies, and brands that stand out in the geotechnology industry.